We reviewed Seagate's single-drive Personal Cloud back in March. 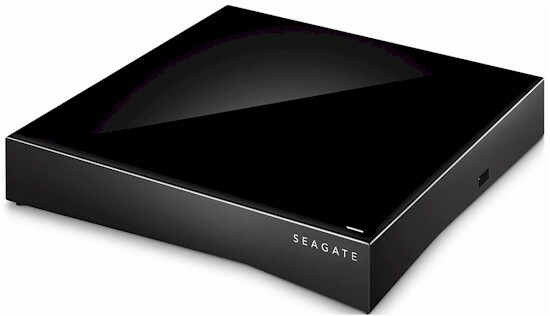 Since then, Seagate added an app for the popular Plex media server. The new app runs on both the single and dual-drive Personal Clouds. But we took the opportunity to see how the 2-Bay version performs for RAID 1. The Personal Cloud 2-Bay is available in 4 TB, 6 TB and 8 TB capacities. Seagate sent the 8 TB STCS8000100 model for review, which at time of review costs around $450. The cheapest you can get a 2-Bay is $285; there are no diskless models. The two-bay version comes configured in RAID 1 by default, but you can change that to RAID 0 if you're ok with the complete drive erase that comes when you change RAID modes in either direction. Neither RAID level migration or capacity expansion is supported. Since it has to hold two drives, the 2-Bay is about twice as deep, but just as wide as the single bay Personal Cloud. I tried to show this in the crudely-crafted composite image below; the single bay is 4.7 in. / 119mm deep, the 2-bay 9.2 in. / 234mm. The rear panel has the same layout as the single-bay, except for the right-side cover relase button. You give this a press to lift off the cover to get at the drives. I'm not sure why Seagate wanted you to be able to easily access the drives in the 2-Bay and not the 1-Bay. You'll see in a bit that it takes some work to swap them out. The objects of interest on this panel are (left to right): power switch; power socket; 10/100/1000 Ethernet port; USB 2.0 port; reset button and cover release. The USB 3.0 port is on the left side (viewed from rear). The single power/activity light is at the top front right (viewed from front) of the box. The controls and positions are the same on the 1-Bay. Both Personal Cloud models appear to use the same motherboard, with alternate loadings. The 2-Bay version gets a combo SATA/power connector for the second drive. Key components are summarized in Table 1. I corrected the processor model from the 88F6706 I had in the 1-Bay review. I decided to get better board pictures this time and took the whole thing apart. Most of the components are mounted on the side of the board facing the bottom of the product. The Marvell SoC and Asmedia USB 3.0 controller are coupled to the bottom shield/heatsink plate via thermal pads that were removed for the photo. The connector at photo right plugs directly into Drive 1. Drive 2 is cabled to the vertical connector just to its left, as shown in the photo below. Note the two-bay has Seagate NAS series drives (ST4000VN000); the 5 TB single bay Personal Cloud had a Series Desktop series drive (there is no NAS series 5 TB drive). Similar to the single-bay, the 2-Bay has all metal pieces tied together with metalized tape; the better to minimize its RF noise from interfering with other devices. So if you need to change a drive, you need to carefully peel the tape aside. Noise from the Seagate Personal Cloud was rated Low. While there is no fan, drive noise was definitely audible in my quiet home office. Power consumption for the external "brick" power supply was 11 W, the same as the single-bay with its one drive. Unlike the single bay, the 2-bay spun the drives down properly so I could measure its 6 W standby power draw. But a short time later, the drives would power up again, even though I wasn't accessing it.